Yikes - I've been seriously slacking! 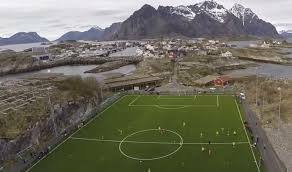 Before that I'll be in Norway playing some soccer on a cool soccer field on an island! Here's a picture of the field in Henningsvaer. Pretty cool huh?